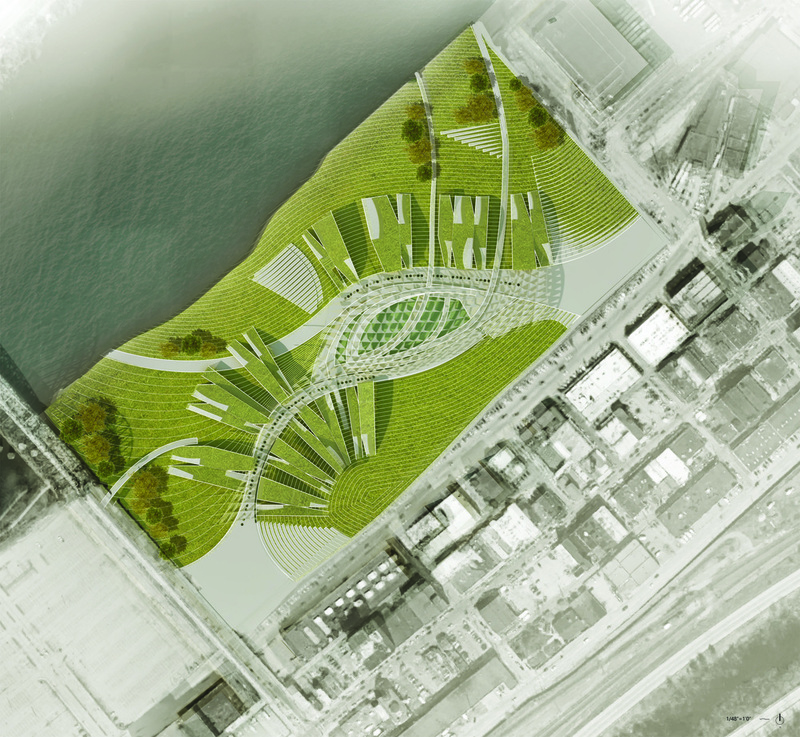 This is a semester-long project of incorporating eco-machines and housing design to create a riverfront housing plus park in Strip District, Pittsburgh, the US. The project started with a closely study of the ecological systems of the site, including wind, sun, water, traffic, history and etc. Also, we did a close reading and analysis of precedent housing project. For this project, we focused on living machine as a core element that structured the whole design, which would transform waste water into clean water. 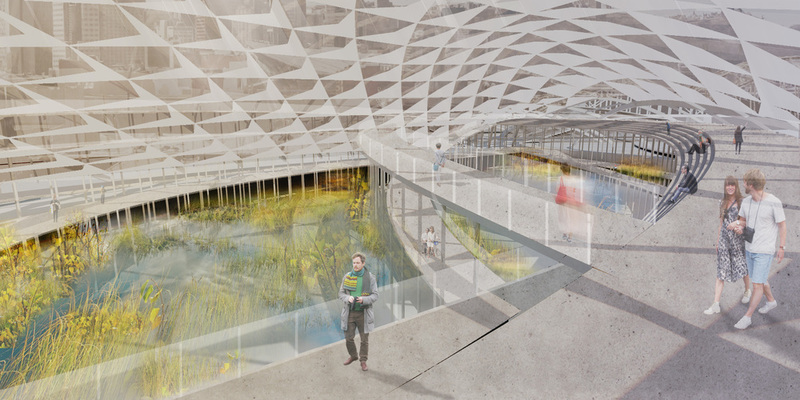 The aim of the design is to use open aerobic reactor (vegetation tanks) and constructed wetland as architectural elements in housing units to create interesting interaction between nature and people. 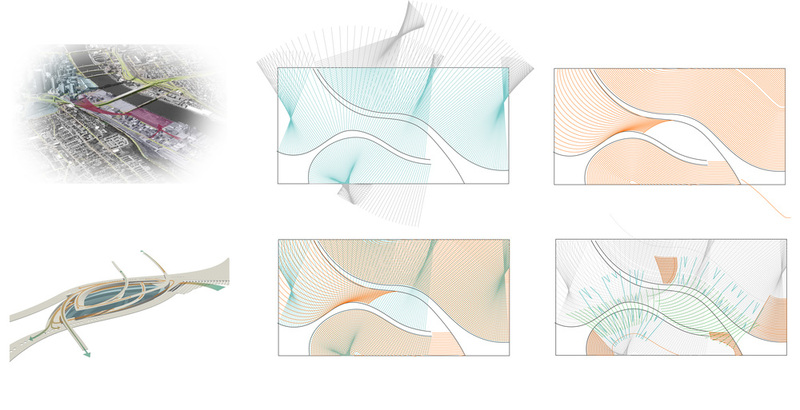 The design process is about finding the form that would achieve this goal by using various parametric design tools. We firstly quantified the relationship between the total volume of apartments, open aerobic reactors and the constructed wetland. 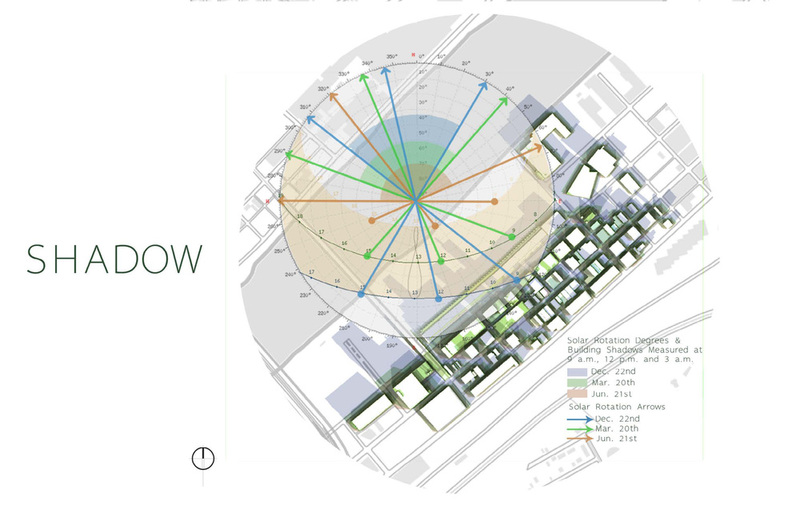 Based on this, we mapped the apartment buildings, wetland, open aerobic reactors and trees on the site to test the shadow condition and human experience of the design. Then we continued our form finding by focusing on one module. 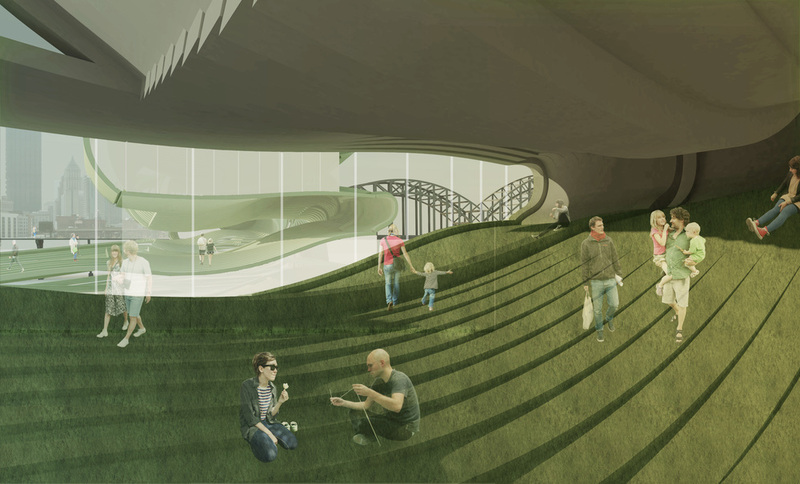 We proposed a green roof system to place open aerobic reactors on strips that forms the roof of the module. The position of reactors are determined by solar analysis and parametric tools. In this way, the aerobic reactors as vegetation tanks are introduced inside the building. We also studied the different human interaction on the rooftop strips based on the different slopes of strips. When we came to the urban design phase, we determined that our proposal for this eco-housing project is to create a housing plus park place for residents of the apartments and for people in Strip District by making living machine as the attraction and the focus of this project. According to the site study, there are two major entrance for residents and people in the neighborhood to enter the site separately. In the middle is the indoor wetland park. Two main streets going through the site with open aerobic tanks placed on them. Eco-machines are used in this project as visual attractions on site, including green roofs on the housing, living machine (including constructed wetland & open aerobic reactors) in the public space, in order to help visitors and residents to be engaged in the eco-system around them. As the wetland and the reactors need to be kept indoor, there are a dome and a canopy above them. The structure and shading system of the dome and the canopy is designed by parametric tools and based on the solar analysis of the surface area.